Ashland club rebuilds three overgrown and damaged trails to open a route traversing the most famous sections of the Rogue River canyon. MARIAL, Ore. — A 25-mile backpacking route in southwest Oregon’s Wild Rogue Wilderness has been restored. The Ashland-based Siskiyou Mountain Club rebuilt three overgrown and damaged trails this summer to open a route that traverses the most famous sections of the Rogue River canyon while also exploring remote corners of the 35,818-acre wilderness in Curry County east of Agness. 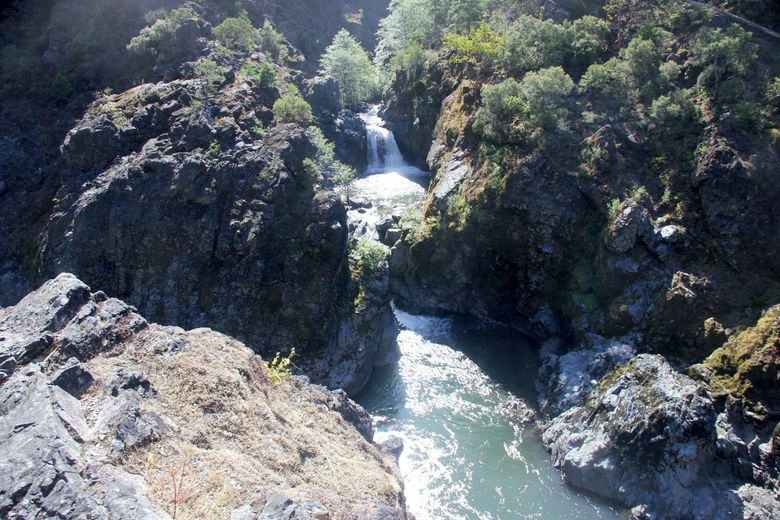 Known as the Wild Rogue Loop, the route combines the Rogue River, Clay Hill, Panther Ridge and Mule Creek trails into a challenging tour that can begin and end in the unincorporated town of Marial. “It offers the best and least-visited features of this famous wilderness area, and there’s something new with each turn,” said Gabe Howe, executive director of the club, a nonprofit that specializes in maintaining wilderness trails. “There’s pristine gorges, virgin old-growth and a strikingly unique and beautiful landscape you just can’t find anywhere else. Part of the motivation in restoring this route, said Howe, was offering backpackers a more wilderness-focused alternative to the 40-mile Rogue River Trail, which stays close to a river packed with rafters during the summer, making solitude rare. The national recreation trail also has become increasingly popular for commercially guided hiking and trail-running trips, which often feature craft beers, wines and catered lunches for guests. Howe was critical of the atmosphere in a federally designated wilderness area. “Let’s face it: The Lower Rogue has become overdeveloped and exploited by commercial interests,” said Howe, a former caretaker at the Rogue River Ranch, a museum that highlights the river’s history. “I spent a lot of time on the Rogue this summer, and it has changed. There were drones flying up and down the canyon and rowdy parties with Sierra Nevada flags — it can feel like a frat party down there in the summer. The Siskiyou Mountain Club crews, composed primarily of college students from Oregon, focused their efforts on the Clay Hill, Panther Ridge and Mule Creek trails. Using crosscut saws and loppers — motorized tools are forbidden in wilderness areas — they cleared hundreds of trees burned in the 2005 Blossom Fire, along with clearing bush and rebuilding trail bench. Although there are multiple places to access the route, most will begin in Marial, a remote town home to Marial Lodge and the Rogue River Ranch. From Marial, the route follows the Rogue River Trail for 9.8 miles, passing famed landmarks such as Mule Creek Canyon, Inspiration Point and Blossom Bar rapids. At Clay Hill Lodge, the route turns north into the more remote half of the wilderness, climbing Clay Hill Trail through oak savanna for 4.25 miles to Panther Ridge. Panther Ridge is a crest high above the river, home to old-growth forest and Hanging Rock, a dramatic outcropping that offers views across the length of the canyon. The final leg follows Mule Creek Trail back to Marial. Mikaela Lea, a sophomore at Oregon State University, said the canyon swimming holes on Mule Creek are one of the route’s highlights. “If you just swim down Mule Creek from where the trail crosses, there’s some really cool spots,” the Brookings native said. It’s possible to complete the route in fall, spring, summer and even winter, depending on conditions. Hanging Rock, the route’s highest point, is around 4,200 feet and may be covered in snow. To get more information on this route, see: siskiyoumountainclub.org/wilderness/wild-rogue. Before the Wild Rogue Loop, the Siskiyou Mountain Club also restored a route through the Kalmiopsis Wilderness. Known as the Trans-Kalmiopsis Route, the trail cuts through an area damaged by the 2002 Biscuit Fire and is the trail system to access the Wild and Scenic Upper Chetco River. They also have restored trails in the Red Buttes and Soda Mountain wilderness areas.